For each passenger I need to require NAME, COUNTRY, PASSPORT NUMBER, BIRTH DATE, and OCCUPATION. 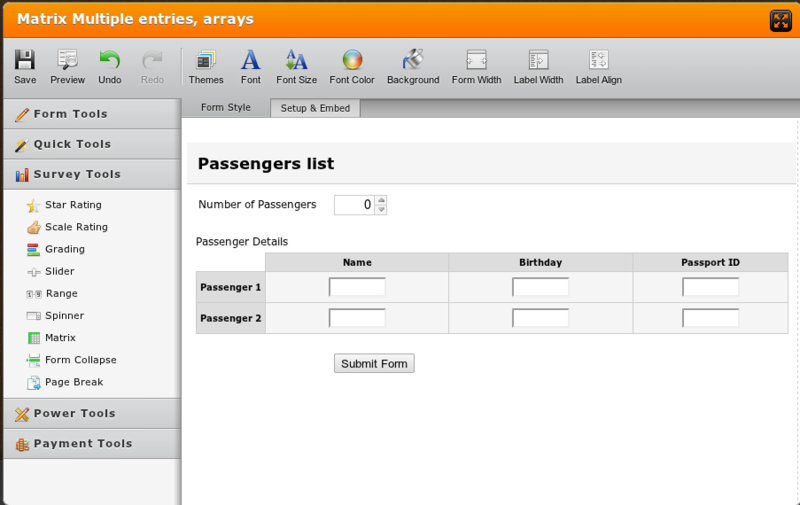 I need to show required fields for only the number of passengers selected. But if "How many in your group:" equals another number, that many groups of data questions will be shown. For more than ten in a group, I may just give a text box and ask the form filler to write in the rest of the passenger information, depending on how complicated adding more sets of questions is. What is the most efficient way to accomplish this task? My first thought is to create another form with the 5 questions, and then embed it 10 times with a different header for each one (passenger 1, passenger 2, passenger 3, etc), or creat and embed 10 different forms. Then if it is possible, I could "SHOW" only the number of embeded forms as the number in the group. If the form filler says there is "more than ten, then ten embeded forms would "show" plus a text box would show asking them to fill in the data for passenger 11 and on. Something like that. But I don't know if that will work, and there might be a cleaner, simpler, more poetic solution? It is still possible using the condition options like the way you did in your form, but I'm afraid it's a huge work to do. We couldn't give you much quick and easier solution as that is the only way to meet the functionality you are looking for. You can check my sample demo which already composed 3 conditions. If you need clarifications just let us know, we would be happy to help you. So if for each passenger I have a header plus 5 required feilds = 6 fields to show for each passenger, and if I allow up to 10 passengers, then I will have to make 330 conditions!! There has got to be a better way, no? Anyone have a better way to set up the form? At the moment, each submission creates one row of record. There is no way to make the number of fields dynamically corresponding to a particular field's value. Doing so will require you to identify a particular max number of entries, say you get less than 10 passengers per group, how about adding passenger index in the rows? any new modification regarding this "problem"...or paoloumali's ideea is the best for now...? Yes, pauloumali's idea is best for now. We do not have direct solution for this but you can always achieved this using hide/show conditions option. Yes, pauomaliś solution works best for now as far as I can tell, and it is good enough for now, though I hope a better solution evolves eventually.